UNITED STATES – California seems to be the winner with so many wildfires igniting every so often followed by States such as Washington, Oregon, Idaho, Oklahoma, Arizona, and the list grows like an out-of-control firestorm. 377 (AZ) | Apache-Sitgreaves NF. 5 miles NE of Heber. Timber and tall grass. Minimal fire behavior. 4,833 acres. 90% containment. 57 personnel. 1 crew, 2 engines 1 helicopter. $1.2M CTD. 416 (CO) | San Juan NF. 13 miles N of Durango. 20,131 acres. 15% contained. Timber and brush. Active fire behavior with short-crown runs, isolated torching and spotting. 917 personnel. 20 crews, 47 engines, 8 helicopters. $9.2M CTD. 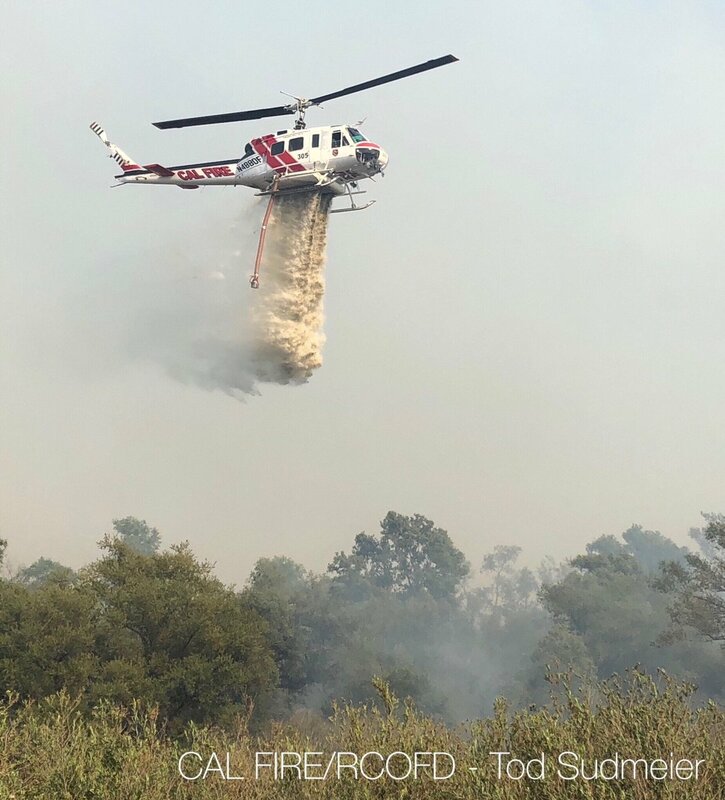 APPLE (CA) | Tehama-Glenn Unit, CAL FIRE. 5 miles NE of Flournoy. 2,956 acres. 96% contained. Brush and tall grass. Min fire behavior. 6 personnel. 2 engines. 9 structures lost. $185K CTD. BADGER CREEK (WY) | Medicine Bow-Routt NF. 2 miles NW of Mountain Home. 1,000 acres. 0% containment. 198 personnel. 5 crews, 10 engines, 5 helos. 1 structure lost. $50K CTD. NEW fire in the last 24 hours. BELLA CREEK (AK) | Southwest Area Forestry; DOF. 400 acres. 0% containment. Unknown location. BOCCO (CO) | Colorado River Valley Field Office of the BLM. 3 miles NE of Wolcott. 415 acres. 50% containment. BURRO (CO) | San Juan NF. 14 miles S of Rico. Timber. Active fire behavior with short crown runs, flanking and torching. 2,136 acres. 0% containment. 168 personnel. 4 crews, 2 engines. $450K CTD. BUZZARD (NM) | Gila NF. 10 miles E of Reserve. Moderate fire behavior with flanking, backing, creeping. Structures threatened. 41,227 acres. 69% containment. 410 personnel. 8 crews, 9 engines, 3 helicopters. $10.8M CTD. CHROME (CA) | Tehama-Glenn Unit, CAL FIRE. 5 miles NW of Chrome. 2,290 acres. 75% contained. Brush and tall grass. Minimal fire behavior. 221 personnel. 10 crews, 15 engines, 1 helo. 1 structure lost. $635K CTD. DENIKTAW RIDGE (AK) | Galenza Zone of BLM. 20 mi SW of Hughes. 8,525 acres. 0% contained. 32 personnel. 1 crew, 1 helo. $195K CTD. DOESTOCK CREEK (AK) | SW Area Forestry; DOF. 213 acres. 0% containment. 5 miles South of Chuathbaluk. Timber and short grass. Active fire behavior with creeping, smoldering and single-tree torching. 13 personnel. $1K CTD. DEVIL’S ELBOW (AK) | SW Area Forestry; DOF. 180 acres. 0% containment. DULBY HOT SPRINGS (AK) | Galena Zone, BLM. 10,000 acres. 0 % containment. EAGLE CANYON (OK) | SE Area, DOF. 9 miles E of Cloudy. 300 acres. 50% containment. 16 personnel, 7 engines. $18K CTD. EMERY GAP (NM) | Cimarron District. 8 miles N of Folsom. Timber, brush ad short grass. Minimal fire behavior. 834 acres. 60% containment.137 personnel. 6 crews. 18 engines. 5 helicopters. $300K CTD. EUCLIDE (CA) | CAL FIRE – Riverside Unit. Off Hwy 71 S of Euclid Avenue in Chino. Riverside County. 100 acres. 5% contained. Forward spread stopped. FAIRHAVEN CREEK (AK) | Galena Zone of the BLM. 15 miles S of Buckland. 876 acres. 0% containment status. GWEEK (AK) | SW Area Forestry; DOF. 320 acres. 0% containment. 0 resources. HAYSTACK (AK) | Tanana Zone of the BLM. 22 miles N of Lake Minchuina. JUDD (AZ) | SE District, DOF. 3 miles N of Bisbee. Brush and tall grass. 4,093 acres. 85% containment. 163 personnel. 7 crews, 1 engine, 1 helo. $500K CTD. KILOLITNA RIVER (AK) | Tanana Zona of the BLM. 52 miles NW of Rampart. 600 acres. 0% containment. MOHAB (UT) | 8 homes destroyed in Moab wildfire, fire tears through homes in Holyoak. Over 100 residents are evacuated. SHELTERS 1) Gravel Pit Lanes Bowling Alley, 1078 Mill Creek Drive. 2) Grand Center, 182 N 500 West. 3) The Gonzo Inn, 100 W 200 South. MOLYBDENUM MOUNTAIN (AK) | SW Area Forestry, DOF. 18 miles N of Chuathbaluk. 650 acres. 40% contained. Active fire behavior with creeping, backing, single-tree torching. Timber and short grass. NORTH INNOKO (AK) | Galena Zona of the BLM. 32 miles NE of Ophir. 2,000 acre. 0% contained. OTTER BAY (FL) | National Forests in FL. 7 miles NE of Lake City.Southern rough. 120 acres. 50% contained. 13 personnel. 2 engines. 1 helo. $5K CTD. OUR CREEK (AK) | SW Area Forestry; DOF. 200 acres. 8% contained. PINE RIDGE (UT) | Vernal Field Office of the BLM. 14 miles NW of Vernal. 521 acres. 85% contained. Timber, brush and short grass. Minimal fire behavior. 2 personnel. 1 engine. $727K CTD. PORTER (OK) | OK DOF. 2 miles S of Kenton. Brush and grass. Extreme fire behavior with group torching, short crown runs and spotting. 3,000 acres. 10% containment. 78 personnel. 18 engines and 1 helo. $183K CTD. RABBIT RIVER (AK) | Galena Zone of the BLM. 700 acres. 0% containment. RIM (ID) | Upper Snake Field Office. 10 miles SW of American Falls. 1,111 acres. 75% contained. Brush and tall grass. Mod fire behavior with isolated torching. 44 personnel. 2 crew. 3 engines. $75K CTD. SANTIAGO FIRE (CA) | CAL FIRE. Off Hwy 241 x Santiago Canyon Road (Orange County). 155 acres. 60% containment. Forward spread stopped. SCENIC LOOP COMPLEX (TX) | TX A&M Forest Service. 15 miles NW of Ft. Davis. 190 personnel. 4 crews, 27 engines, 5 helicopters. 26,380 acres. 100% containment. $2.3M CTD. SOAP LAKE (WA) | Grant County Fire District 7. 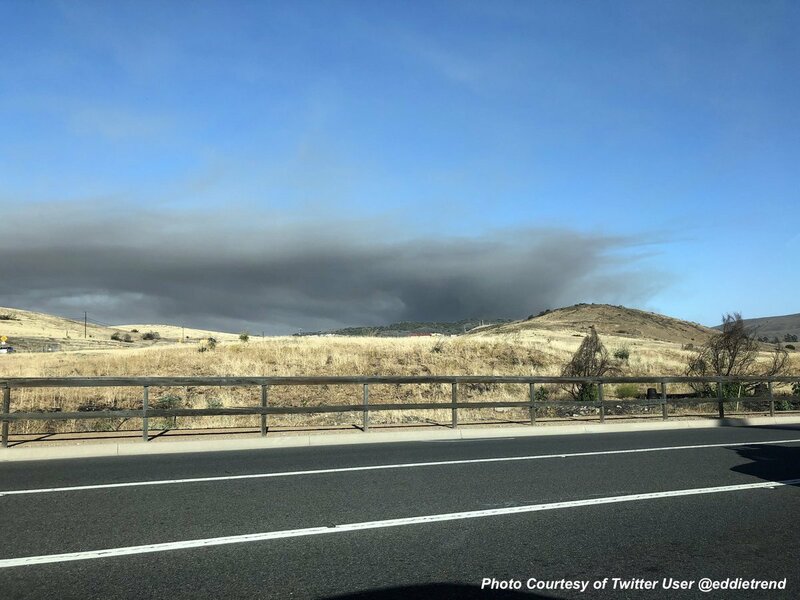 Fire started on June 11, 2018 @ 1630 hours along SR 17 4 miles north of Soap Lake.. 2,000 acres of sage and brush. 50% containment. 1 small outbuilding was lost overnight. State Fire Mobe resources authorized on June 12, 2018, at 0045 hours. Unknown cause. Under investigation. SOLDIER CANYON (NM) | Mescalero Agency of the BIA. 1 mile NE of Mescalero. Timber, brush and medium logging slash. Moderate fire behavior with single-tree torching, flanking and backing. 1,270 acres. 90% containment. 418 personnel. 11 crews, 13 engines, 4 helos. $2.5M CTD. SOUTH (CA) | San Benito-Monterey Unit/CAL FIRE. 5 miles SW of Santa Clarita. 175 acres. 95% containment. Chaparral, brush and tall grass. Minimal fire behavior. 42 personnel. 5 engines. $1M CTD. TRAIL MOUNTAIN (UT) | Manti-Lasal NF. 15 miles NW of Orangeville. 1,737 acres. 10% containment. Timber and brush. Extreme fire behavior with crowning and wind-driven runs. 262 personnel. 7 crews, 11 engines, 5 helicopters. 1 structure destroyed. $3.5M CTD. TRIMOKISH HILLS (AK) | SW Area Forestry; DOF. 18 miles S of Fairbanks. 1,500 acres. 0% containment. TUMIT CREEK (AK) | Galena Zone of the BLM. 517 acres. 0% containment status. TUSIKPAK LAKE (AK) | Galena Zone of the BLM. 16 miles E of Point Hope. 13,344 acres. 0% contained. UTE PARK (NM) | Cimarron District. 1 mile E of Ute Park. Timber, brush and short grass. Minimal fire behavior. 36,740 acres. 92% contained. 244 personnel. 4 crews. 8 engines. 2 helos. 14 structures lost. $8.3M CTD. WEBBER CREEK (AK) | Upper Yukon Zone of the BLM. 32 miles E of Circle Hot Springs. 2,944 acres. 0% containment. WILLOW (NM) | Gila NF. 6 miles E of Mogollon. New wildfire in the last 24 hours. Active wildfire with short-range, spotting, smoldering and backing. 350 acres. 0% containment. Not being managed by a Type 1 or 2 IMT. 89 personnel. 2 crews, 3 engines, 1 helo. $74K CTD. WILLOW CREEK (UT) | Uinta/Wasatch-Cache, Forest Service. 20 miles SE of Heber. 650 acres. 10% containment. ZITZIANA RIVER (AK) | Tanana Zone of the BLM. 800 acres. 0% containment.